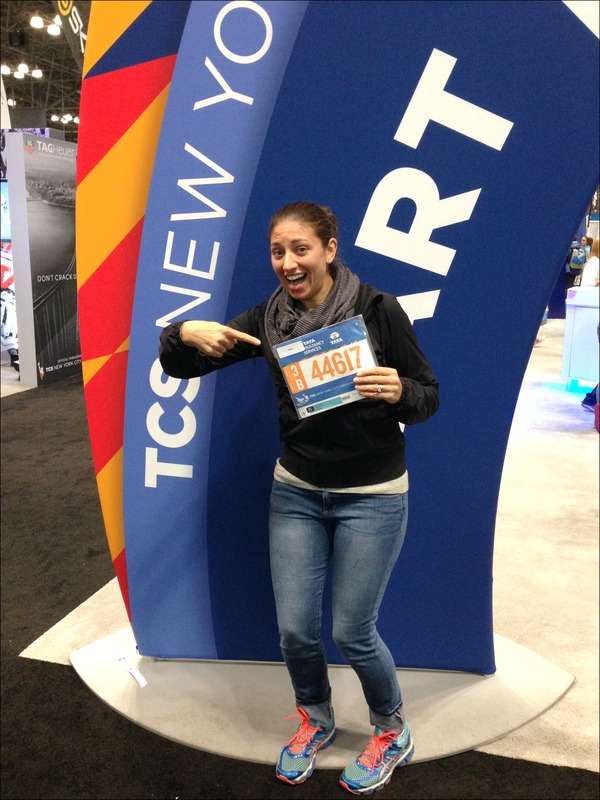 So much to cover regarding the New York City Marathon weekend! Since I’d really like to go into a bit of detail and make sure to address some of the things that I was concerned about before the race I’m going to break the weekend up into several posts – hopefully the details and tips about what to expect will help future NYCM runners who are anxious about some of the logistics! On Saturday morning, Jason and I headed into the city from Long Island, our plan was to attend a Team Animal League pre-race rally at a hotel by Grand Central and then meet up with my friends Daniel and Patrick to go over to the expo at the Javits Center. 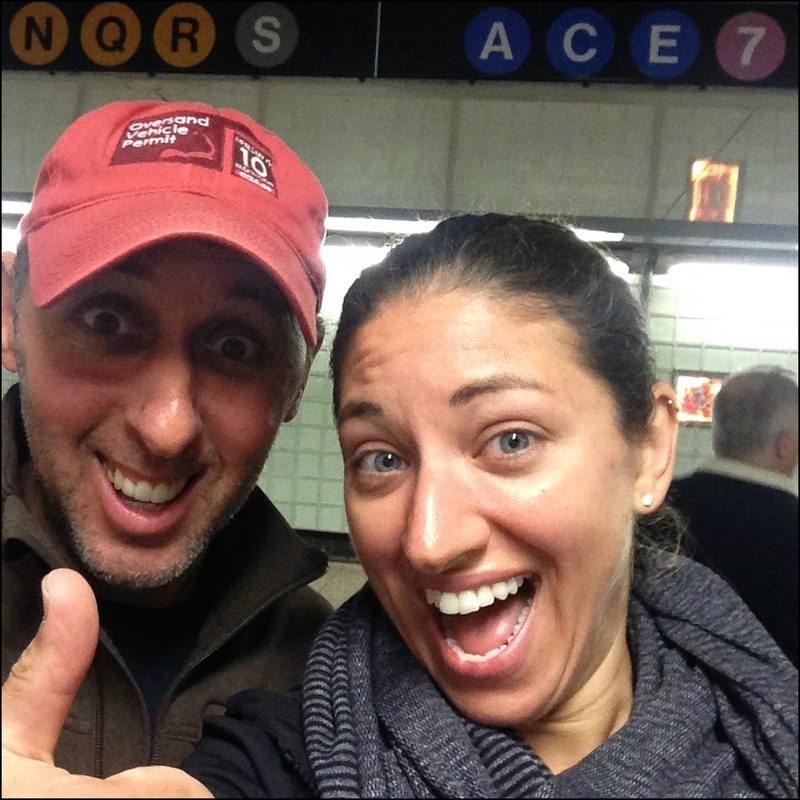 Since it was raining and gross out we decided to take the subway (plus Jason was going to have to navigate the subways the next day to spectate so we figured it was good practice!). We successfully managed to take the subway and end up in the right place, so as any good former (totally city clueless) New Yorkers, we celebrated this accomplishment! 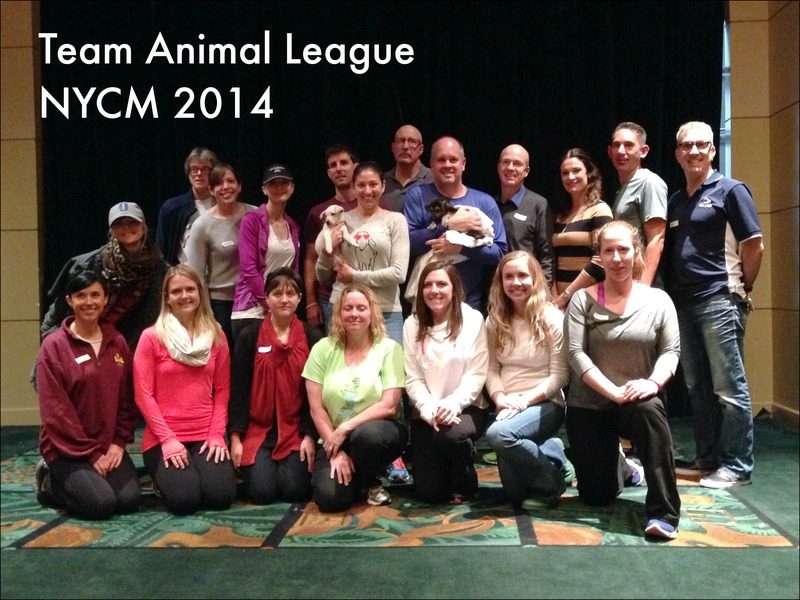 At the Team Animal League rally we got to meet with some of the other runners who were running on behalf of North Shore Animal League which was a lot of fun. We were also told that as a team we raised $125,000! Many were running their first marathons, so we shared tips, talked race strategy and commiserated about the predicted windy forecast for the next day. We had lunch and a short Q&A session with a team member who has run New York several times before and of course played with puppies some more! 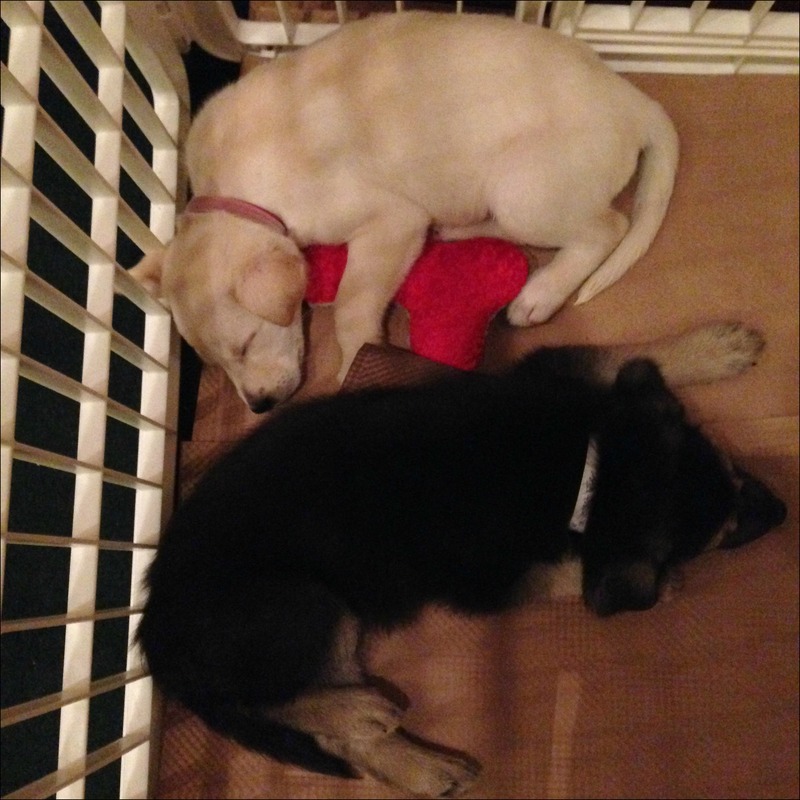 By the time we left these two were all tuckered out! To get to the expo, we decided to try to take the free shuttle bus that was being provided from Grand Central over to the Javits Center. This was much easier said than done! The expo funneled us right in to get our bibs and race shirts and then I immediately went over to the transportation desk. You may remember that one of my biggest concerns was that I had chosen the bus transportation and Daniel and Patrick had chosen the ferry. I was really worried about meeting up with them once we were on Staten Island, so I wanted to try to switch to the ferry (despite my concern of getting sea sick before running 26.2 miles). We wandered the expo for a few and checked out the race merchandise. There was a lot of really nice stuff, but it was pretty expensive, and to be honest I never really wear race stuff anyways, so I passed on getting anything. Before we headed out to grab dinner, we couldn’t resist this one last photo op! Do you usually buy/ wear race merchandise? What item would you love to see sold more at race expos? I’d LOVE to see coffee mugs more often! Sounds like a great start to the race! I usually pass on expo stuff too, although love a good hoody or pull over. Hahaha, first of all, never say never (I remember once upon a time I said I’d never run a marathon…) and second, you need to get a puppy. Don’t tell Doug, just come home with one. Haha, I was actually so excited when I was packing and I thought to bring that sweater! It’s so not something I would normally wear/ buy, but when I saw it (on sale!) I couldn’t not get it – this was the perfect time to wear it! You’re exactly right, expos can be both fun and overwhelming…if it’s crowded it gets overwhelming REALLY fast, but it’s interested to walk around and see all the different running products! 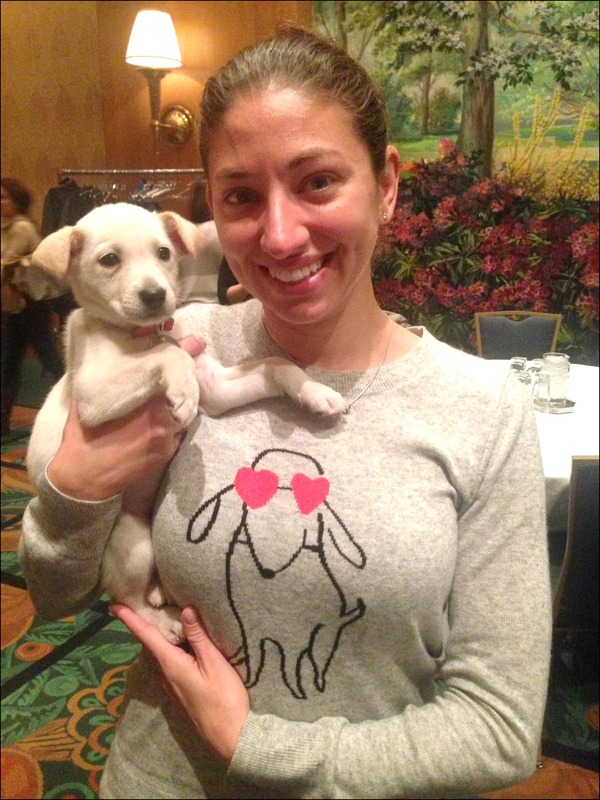 Love the puppy shirt!!! And you know I love the race swag – I buy it all 🙂 I definitely agree on the coffee mugs, and I’d even use water bottles like what Nuun does for major races. I’m also in a trucker hat mode these days! Can’t wait to hear your race recap! Yeah, mugs, water bottles, pint glasses, stuff like that I love and would totally use! Hats are always a favorite for me, and I agree on coffee mugs… good conversation starter in the office! Exactly! I love that the Falmouth Road Race does mugs as their giveaway instead of shirts, I use them every morning! Those puppies are adorable! There’s nothing like a pooped out puppy. Oh I know, they were soooo cute and no one wanted to put them down so they were exhausted by the time the luncheon was over! Man, I really want to do a big race with an expo someday. Most of my races just have bib pick up. I’d love to be able to see more products in general before buying online–various headbands and nutrition options, shoes, gear etc. I usually just have to take a leap of faith and hope whatever I buy works. Yes, the expos are definitely a good place to see & test out all sorts of fun products! 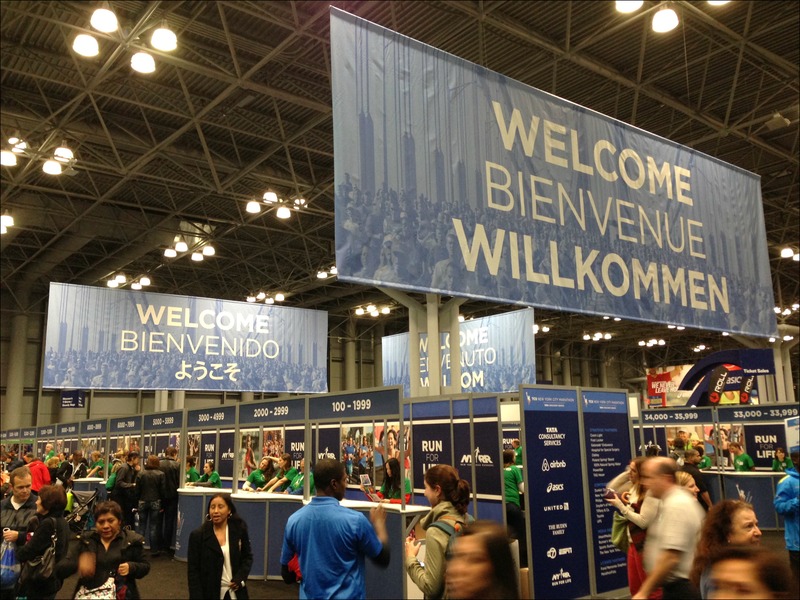 When I was leaving the expo (and too far too turn around at this point) I saw someone with a coffee mug (with RUN NYC… designed like one of the Asics t-shirts). I was hoping it would be online – but nope. I was hoping for a tumbler or coffee mug of some sort. Oh man, I would have totally gotten a mug if they had any when I was there! I didn’t go until Saturday afternoon so I’m sure I was really only seeing the leftover stuff. Oh well, saved some money! I love the puppy shirt! And the puppies!!! I’m with you – I wish all races would have coffee mugs!! I generally am a sucker for hats, coffee mugs or magnets and sometimes all three! Oh yeah, magnets are another good one! Don’t take up much space and you can display them easily! 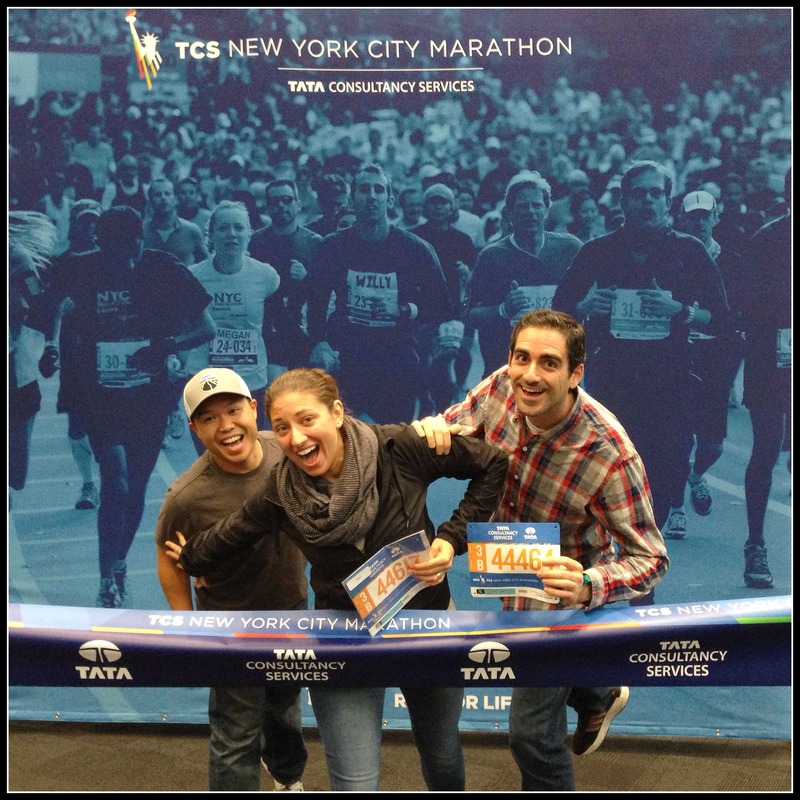 Your pic with the fake finish line tape is way better than mine — love it! I totally splurged in the merch section and bought a jacket, pull-over, and glass. I rationalized that I was already spending a crapload of $$ on the race weekend, why not a little more? 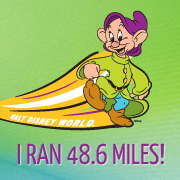 I love mugs from races too — my WDW Marathon Weekend 2014 mug is my official tea mug at work. I use my Falmouth Road Race mug at work! I actually ended up ordering one of the “Finisher” t-shirts online after NYCM, I don’t often wear race stuff, but this one is sort of subtle, so maybe (hopefully!) I’ll actually wear it!